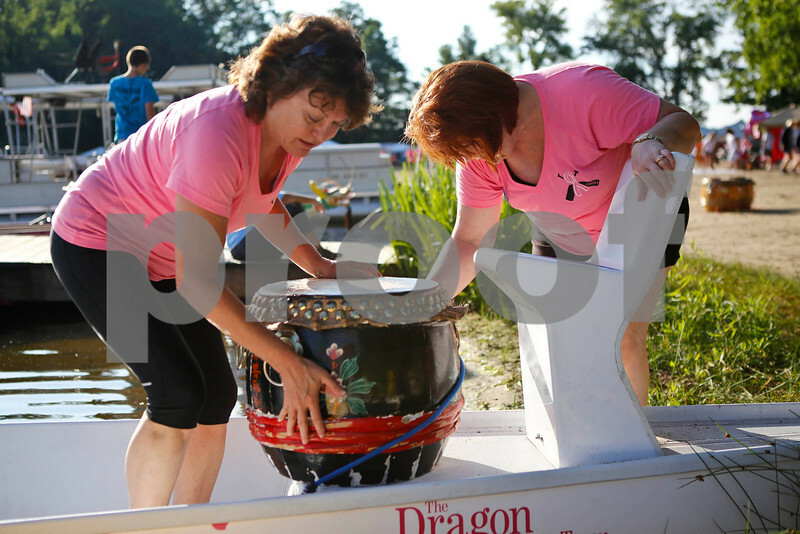 Marilyn Purdy, President of the Dragon Dream Team, hosts of the Portage Lakes Dragon Boat Festival begins the "awakening" ceremony by dotting the dragon's eyes at the Portage Lakes Dragon boat festival a the Portage Lakes State Park in New Franklin, Ohio on July 13 2013. The activities started down an the beach with a ceremonial eye-dotting "awakening of the dragons and three dragon boat teams headed to the finish line every few minutes. Lew Stamp Photography. 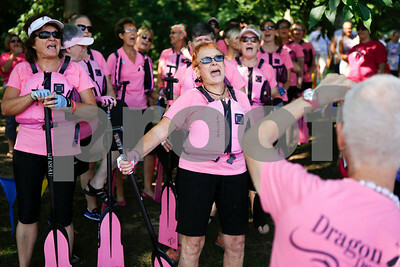 Akron residents Pam Massoli (left) sings a cheer with Portage Lakes Dragon teammate Pat Donnelly (right) as they get set to board their race boat at the Portage Lakes Dragon boat festival a the Portage Lakes State Park in New Franklin, Ohio on July 13 2013. 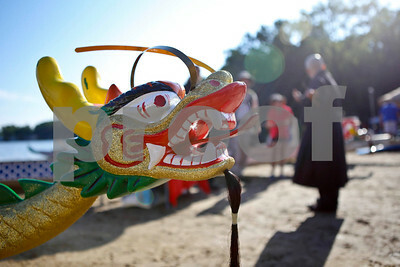 The activities started down an the beach with a ceremonial eye-dotting "awakening of the dragons and three dragon boat teams headed to the finish line every few minutes. Lew Stamp Photography. Dragon boats race down the course in back ground as the next boats for the next heat leave the dock in foreground, at the Portage Lakes Dragon boat festival a the Portage Lakes State Park in New Franklin, Ohio on July 13 2013. The activities started down an the beach with a ceremonial eye-dotting "awakening of the dragons and three dragon boat teams headed to the finish line every few minutes. Lew Stamp Photography. 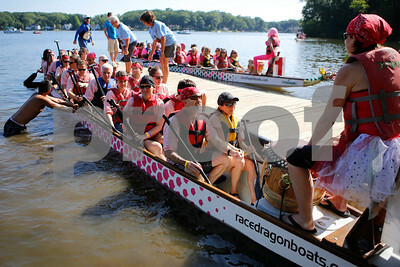 Teams return to dock after a race at the Portage Lakes Dragon boat festival a the Portage Lakes State Park in New Franklin, Ohio on July 13 2013. The activities started down an the beach with a ceremonial eye-dotting "awakening of the dragons and three dragon boat teams headed to the finish line every few minutes. Lew Stamp Photography. Green resident Mary Hlavac a drummer for Portage Lakes Dragon ,Team team Courage celebrates at the Portage Lakes Dragon boat festival a the Portage Lakes State Park in New Franklin, Ohio on July 13 2013. The activities started down an the beach with a ceremonial eye-dotting "awakening of the dragons and three dragon boat teams headed to the finish line every few minutes. Lew Stamp Photography. 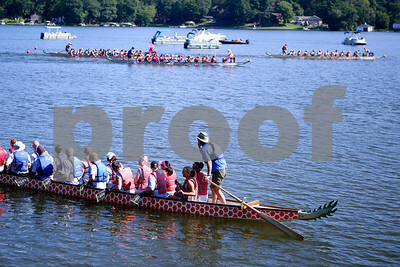 A trio of boats cross the finish line at the Portage Lakes Dragon boat festival a the Portage Lakes State Park in New Franklin, Ohio on July 13 2013. 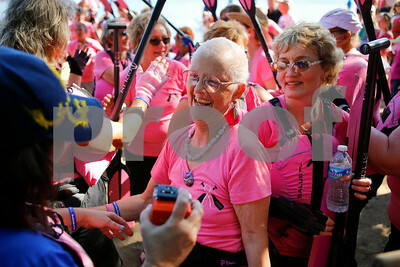 The activities started down an the beach with a ceremonial eye-dotting "awakening of the dragons and three dragon boat teams headed to the finish line every few minutes. Lew Stamp Photography. 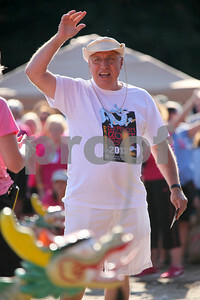 New Franklin Mayor Al Bollas opens the day at the Portage Lakes Dragon boat festival a the Portage Lakes State Park in New Franklin, Ohio on July 13 2013. The activities started down an the beach with a ceremonial eye-dotting "awakening of the dragons and three dragon boat teams headed to the finish line every few minutes. Lew Stamp Photography. 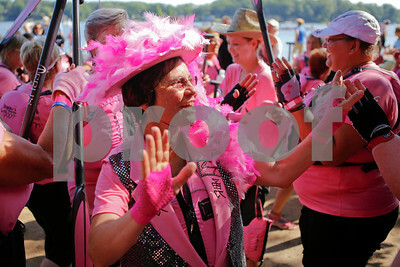 Massillon resident and Catholic Sister, Susie Corrigan (center) celebrates with teammates after race at the Portage Lakes Dragon boat festival a the Portage Lakes State Park in New Franklin, Ohio on July 13 2013. 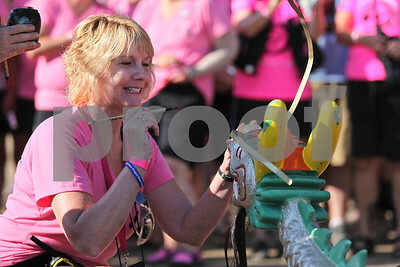 The activities started down an the beach with a ceremonial eye-dotting "awakening of the dragons and three dragon boat teams headed to the finish line every few minutes. Lew Stamp Photography. 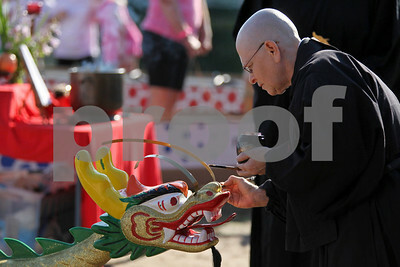 Buddist monk Myoshu Wren be gins the "awakening" ceremony by dotting the dragon's eyes at the Portage Lakes Dragon boat festival a the Portage Lakes State Park in New Franklin, Ohio on July 13 2013. The activities started down an the beach with a ceremonial eye-dotting "awakening of the dragons and three dragon boat teams headed to the finish line every few minutes. Lew Stamp Photography. Akron resident Pam Massoli (left) and Copley resident Connie Delehanty mount a drum on a dragon boat at the Portage Lakes Dragon boat festival a the Portage Lakes State Park in New Franklin, Ohio on July 13 2013. The activities started down an the beach with a ceremonial eye-dotting "awakening of the dragons and three dragon boat teams headed to the finish line every few minutes. Lew Stamp Photography. Canton resident Lily Conn 11 takes a photograph of a drum at the Portage Lakes Dragon boat festival a the Portage Lakes State Park in New Franklin, Ohio on July 13 2013. The activities started down an the beach with a ceremonial eye-dotting "awakening of the dragons and three dragon boat teams headed to the finish line every few minutes. Lew Stamp Photography. 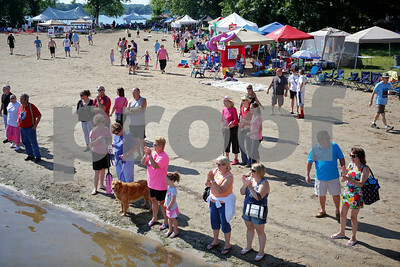 Race fans cheer a race from the beach at the Portage Lakes Dragon boat festival a the Portage Lakes State Park in New Franklin, Ohio on July 13 2013. The activities started down an the beach with a ceremonial eye-dotting "awakening of the dragons and three dragon boat teams headed to the finish line every few minutes. Lew Stamp Photography.